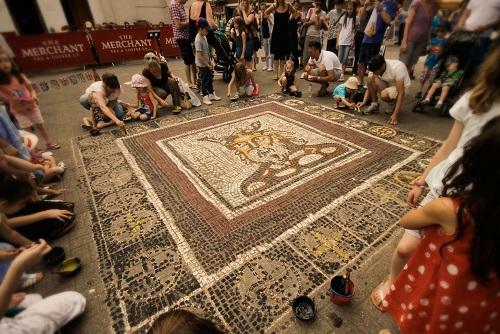 The art of creating images with an assemblage of small pieces of colour; the Romans used glass, stone, and other materials to create beautiful floor art. The Greeks created beautiful Pebble Mosaics, and even the early Christians had a go, creating mosaics on walls and ceiling! This is great at the entrance of a corporate event! 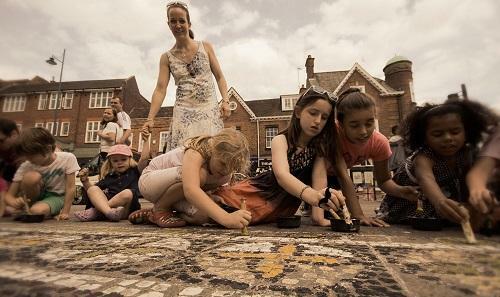 Now, thanks to award winning and internationally acclaimed pavement artists UC, you can have a go too! Using specially made mosaic tile markers and an ancient colour pallet replicating colours used by the Greeks and Roman craftsman. 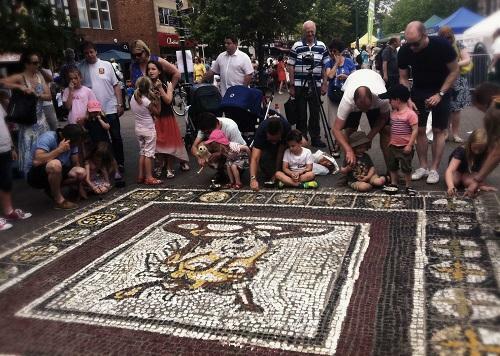 A new workshop for all the family creating beautiful floor mosaics; ideal for historical events, Roman festivals, museum’s and regeneration. – A Digital image of the proposed site to assess suitability of design & surface quality. – A Suitable surface (not too rough and not too smooth); Herringbone brick, Smooth Tarmac, Paving etc. – Safe area free from Traffic during workshop hours. – Adequate sized area free from foot fall congestion (Size varies depending on project, people getting involved and shape of area). – Area should ideally be clean or cleaned and free from loose stones, rubble and glass. – Assistance of stewards or volunteers maybe required on occasion depending upon event and numbers expected to attend. – Overnight accommodation for two artists (twin or double room) this is dependent on overall distance from Liverpool and start time of event. – Adequate and safe parking for vehicle- one car or van. We reserve the right to refuse to work on an area that we deem to be unsafe or inadequate for our needs or do not follow sensible health & safety conditions. Public street art workshop involving poster paints & pure pigments. All materials are safe, none- toxic and ephemeral, meaning that they will gently wash away with the rain or can be hosed down with water after the event (the promoter would be responsible for this) but many people just prefer to leave it to the elements. Nothing we use will damage the fabric of the site in any way and usually disappears with the first rains. Workshops are run on a drop in basis and numbers may vary throughout the event…..we reserve the right to temporarily stop a workshop if we feel the numbers are becoming overwhelming….this rarely happens but at very busy events its sometimes the only way to keep control over proceedings. Four hour continuous – this workshop is not suitable to be broken into separate sessions.